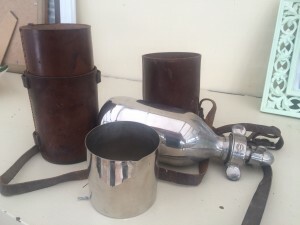 Detail: Electro-plated metal flask, holding a reputed pint and fitted with a drinking cup. 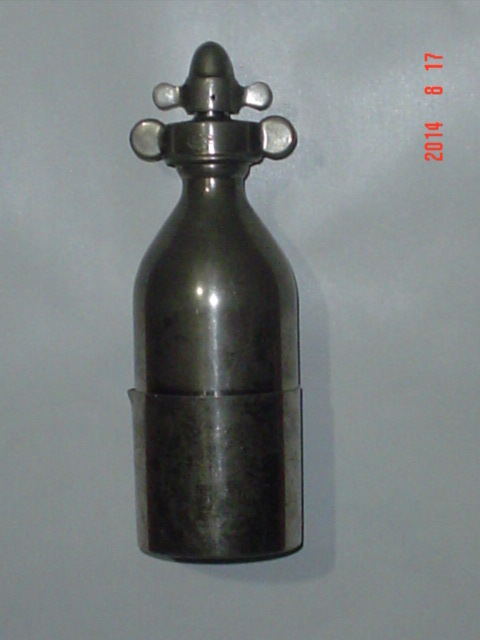 Made by Aerators Ltd, under the brand “Prana Sparklets” it would seem to be an aerating flask, and is likely to be a portable version of the aerating bottle. Uses “A” size bulbs. Notes: This is a very early and rare model and did not know of it’s existence until a site user contacted me in July 2014. I have since seen it detailed in the 1913 William Whiteley store catalogue which I have used for my date estimate. Sale price is 1913 was 5/- which would be £25 in 2014. This example was sold on Ebay USA for $250 in August 2014. Many thanks to Norma G from Mexico City for the pictures. Update Feb 2016. 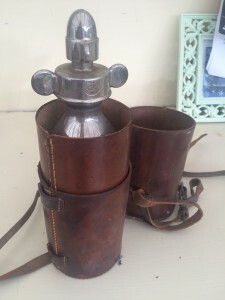 New information from Nick C showing another flask in its’ original leather container proving the initial thoughts that this is a travel flask.